The collection consists of one scrapbook, the contents of which are arranged chronologically. The honorary fraternity Pi Lambda Theta was founded in 1910 for students who excelled in the field of education. The Eta Chapter was formed at the University of Pennsylvania in 1916, two years after the School of Education was established. The fraternity was active in programs that supported students in the School of Education through social programs as well as lectures. Many of its members participated in University’s Schoolmen’s Week, an annual joint meeting of the Southeastern Convention, District of Pennsylvania, State Education Association, held at the University regularly since 1914. With most of the early matriculates of the School of Education being women, the fraternity was predominately composed women graduate students. 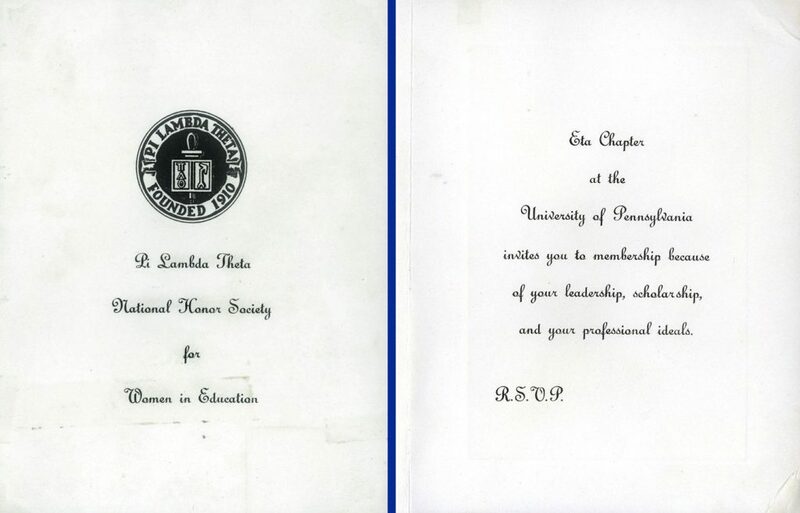 By 1972 the Eta Chapter ceased to retain its own distinct office at the Graduate School of Education and probably shortly afterwards was merged into the larger Philadelphia Chapter of Pi Lambda Theta. The collection which consists of a scrapbook documents all the activities of the fraternity from 1947 to 1953. It contains newsletters, newspaper clippings, invitations, membership lists and photographs of initiates. Pi Lambda Theta. Eta Chapter (University of Pennsylvania).